WordPress CMS which powers nearly 53% of total sites present on the internet and it's growing at some aggressive rate thanks to its open source platform and contribution from the community of developers. I considered the above factors and found the five best WordPress hosting companies in India. There are many reasons to recommend A2 Hosting as best web hosting for India but for a sole reason, I recommend them ahead of other hosting companies. Apart from regular discounts, A2 Hosting comes with 51% OFF which you shouldn't miss out. A2 Hosting partnered with CCAvenue, a payment gateway company in India so that you can pay through your debit card either powered by Visa/Mastercard and even Rupay card too works with them. Note: 2checkout payment gateway also works for Indian cards but comes with higher conversion fees. When I started blogging back in 2013, I struggled a lot to get a web hosting account since most debit cards even powered by VISA/Mastercard won't work with international hosting companies and I ended up buying hosting from local hosting companies where the service was absolutely terrible. Even now, most Government bank cards won't work on International companies like SiteGround, FastComet etc. You can check FastComet Vs A2 Hosting here. I recommend A2 Hosting especially for people who have Rupay debit cards and A2 Hosting is the only Internation company to accept payments from Rupay debit cards. Enough of payment options, let me talk something about A2 Hosting- The Best WordPress Hosting India for 2018. A2 Hosting was founded in 2001 in Ann Arbor, Michigan. A2 Hosting operates in own datacenters in USA, Europe, and Singapore. If you check Hostgator or Bluehost, they are US registered but they outsource their staffs but A2 Hosting operates 100% of US-based people. There is nothing wrong with outsourcing but when it comes to solving customer queries, you need to be knowledgeable, quicker and experienced. A2 Hosting, being a 17 years old company managed by web hosting veterans proves they are better than most local hosting providers. A2 Hosting offers the fastest WordPress hosting solutions thanks to the A2 Optimized WordPress installations it loads faster than most hosting companies in the world. Note: I'm also one of their paying customers since 2016. According to Hostingstep reports, A2 Hosting loads at an average of 172ms which is followed by SiteGround 340ms. Renewal charges are somewhat higher for most companies. As discussed earlier, A2 Hosting is the only hosting to support RuPay cards. However, if you're having VISA/Mastercard issued by private banks in India, you can use the card to get an account with FastComet. If FastComet had India based payment gateway, I would rate them as the #1 Best WordPress Hosting in India. Sadly, they don't have such options, so I rated them as the #2 Best WordPress Hosting. Since I already discussed a lot about FastComet in my review, I directly go with Pros and cons. The first two features free domain for the lifetime and same renewal price for the lifetime are exclusive to FastComet and not available to any other hosting providers. In fact, this blog too hosted on FastComet, you might saw how faster my site loads. Setup fee for one-month hosting plans. Not so many hosting companies get the opportunity to get recommended by the WordPress team itself. SiteGround was founded in 2004 and it's being a decade they are in the industry yet not so famous like HostGator in India. Hostingstep reports that SiteGround is the only hosting company to get 99.99% uptime in their last one year test reports. Setup charge for one-month plans. The SiteGround plan starts from $3.95/month even for 12 months package. Great Uptime: I hold an account with all the above hosting companies to host my niches sites and I'm enjoying good uptime for my sites, which is also important for ranking well in Google results. There may be some hosting companies that offer cheap WordPress hosting India but the uptime will be poor since they host a large number of sites on a single server. 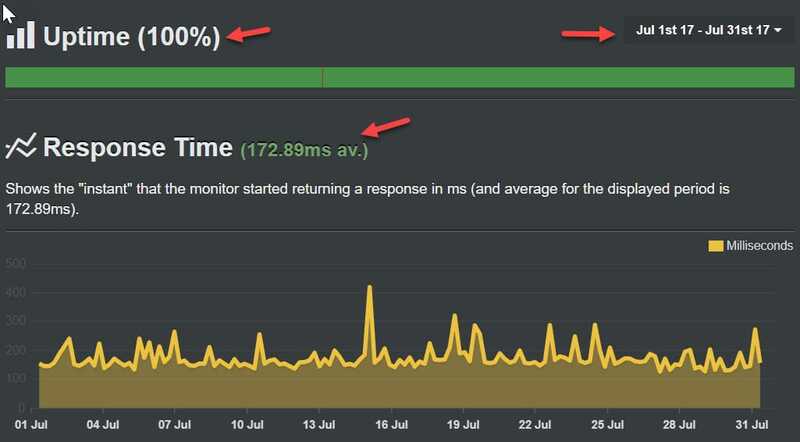 Response time (Speed): Again, I use more than 8 hosting companies but left other WordPress hosting India companies since they lack fast loading sites, for example, this site bloggingio.com hosted on FastComet loads under 150ms but sites hosted on local hosting companies take more than 1500ms to load. 24x7 customer support: All the above companies offer 24/7/365 customer support and at any time, even now browse their website and you'll find they're online to solve your queries. These are the characteristics of the best WordPress Hosting India companies. Renowned company: There are more than 100+ hosting companies launching every year but only survive for a longer period of time. Our recommended WordPress Hosting companies was founded back in the 2000s. Easy payment options: A2 Hosting offers Indian payment gateway, you can even use your Rupay or UPI to make payments. Easily scalable hosting: Once your websites start getting traffic, you need to find the best VPS hosting options to handle large traffic. All the above hosting companies offer easy access to the cloud, VPS, and dedicated server. This post "Best WordPress Hosting India" aims to share you the best WordPress hosting available on the market. Do you have any suggestions or in doubt whether the above three hosting company satisfies your needs? Do comment and we can have discussions.